Daniel Colby Currier (1841-1905) was born in Springfield, New Hampshire, the son of Hiram Lyman Currier (1806-1880) and Julia Colby (1810-1880). The family later moved to Grantham, NH where Hiram and Daniel were sawyers. 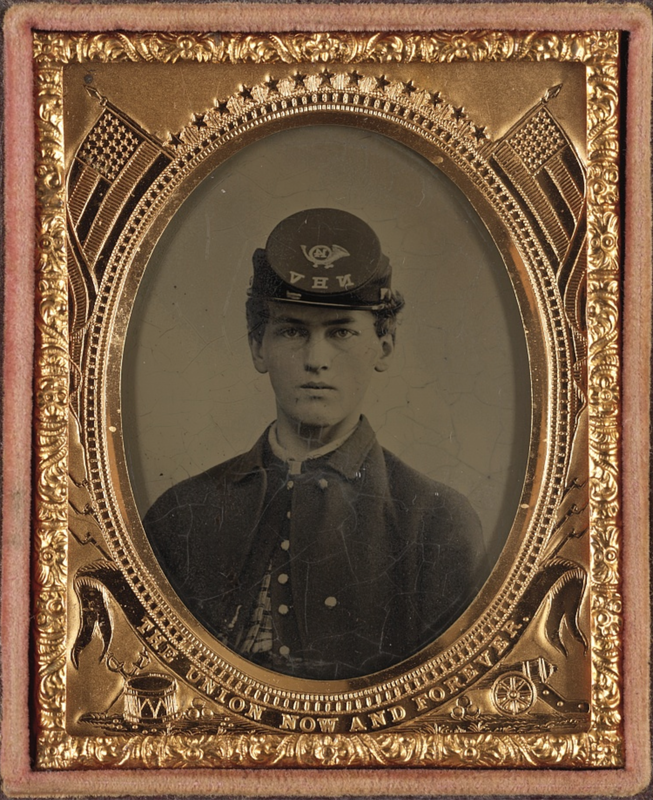 On August 8, 1862, at the age of 21, Currier enlisted. He became a Corporal in I Company of the 14th Regiment of New Hampshire Volunteers and was mustered out on July 8, 1865 in Savannah, Georgia. Currier returned to Grantham and he married Sarah and they had six children: Mary, Gary, Wesley, Udo, Clarence, and Connor. After the war, Currier made his living as a sawyer and a farmer. He died on February 22, 1905. Camp near the depot, Savannah, Ga. I will pen you a word today that you may know I still live and [that I am] in good health, and hope that you enjoy the same blessing. I wrote a letter to Charles H. Shaw yesterday. I wrote one to you the day before and one to Ruth. We had quite a time the 22d in celebrating the birthday of Washington. Had salutes fired, bells rung, music by several bands, &c. &c. The ladies were out in their best attire and everything lovely. I was on duty yesterday and so was Lyman [P. Saunders]. They have sent out quite a squad of men from our regiment this morning on the train to guard the wood choppers from guerillas. There are to stay four days, I understand. The G[rantham] boys are all well as usual today. Newton [Clough] has gone up to the city to do some business, “I reckon.” Thomas [Morrill] is in camp. Lyman [Saunders] and myself are in camp. Came in from duty this morning. The detail has just been made and I haven’t got to go on duty tomorrow, they say, so I will finish this in the morning, “I reckon.” Newton [Clough] goes tomorrow. We have some pretty good news from our army of late. Bully for that. The Sanitary Commission here gave us some sour kraut, pickels, and onions that went pretty good, “I reckon.” Newton & Lyman are talking over old times while I write. There is no news here of importance that I know of. The same old thing over and over again. They are drawing off the cotton every day to be shipped north and returning with merchandise &c. &c.
I will pen a word this morning. The G[rantham] boys are all well as usual today. Newton has gone on duty today. The rest of us are in camp. I should like to be at home today, “I reckon,” — it being Sunday — and have some good baked beans and brown bread. It would be so good, “I reckon.” But I hope and think that before many months that we shall be permitted to return to our several homes, don’t you? It is rainy but warm this morning. We got the rumor here last night that Richmond and Wilmington were ours but don’t take any stock on the rumor. But I think it will be [true] before many weeks, don’t you? I see by the papers that it puzzles the ____ to find out the whereabouts of Sherman. “I reckon” they will find him one of these days to their sorrow. Give my love to all enquiring friends. Write often and all the news. Goodbye.